‘Chrissie’ – Christabel Wise was born on Christmas day 1900 in Toddington, Gloucestershire. She was the fifth of seven children – the first three were boys and the rest were girls. In 1906 Chrissie and her sisters travelled out to Rhodesia with their parents as their father had been appointed as the Agricultural Adviser for the British South Africa Company and was to be based in the country’s capital, then known as Salisbury. Chrissie’s three brothers, Harry, Lancelot and Charlie, remained at boarding school in England from where they found their way to the trenches of the First World War. Their letters, and those of friends serving alongside them, travelled back from the frontline to their fifteen-year-old sister. A few of the letters sent to Chrissie have been passed on to me. The first of them to reach her was a letter from a Captain Petre. 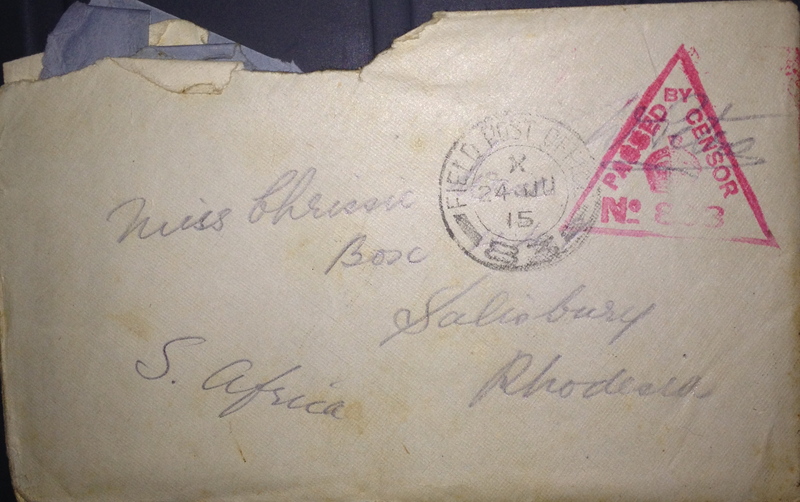 It was written on 23 June 1915 and arrived in Salisbury on 28 July of the same year. You will see I have changed my address again. I have got my second star and have been made Requisitioning Officer to the 83rd Brigade. This is quite one of the ‘spot’ jobs and recommends itself to me immensely. I have a 25hp Vauxhall to get about in & the choice of half a dozen horses to ride. Our brigade has now gone back to the trenches having been absent since the 10th. Things have been quiet up to the present but another big battle is expected any day. I enclose a letter I have had recently from Geoff Simpson. I did not know that Harry and Lancelot had come out. I hope to come across them some time or other. I liked your account of the Battle of Stapleford. It sounds rather like a fight we had the other day with one of the Gunner Messes – weapons used bread & biscuits. What did you think of young Warneford’s ‘stunt’? I met him once. A very nice boy but, like all heros, he did not look one. The type of plane flown by Warnesford against the Zeppelin WW1: A captured Moran-Saulnier Type l (note the German insigna). It was a “parasol” monoplane (a single-wing above the fuselage). WWI: Portrait of Flight Sub-Lieutenant R.A.J. Warneford VC. Photo taken 17 February 1915. Flight Sub-Lieutenant Reginald Warneford, born in Darjeeling, India, was awarded the Victoria Cross (VC) at the age of 23 for the actions he took, alone and at night, to bring down one of the dreaded Zeppelins whose bombs terrified England. He was the first British pilot to achieve this feat. On the night of 7 June 1915 Warneford, part of a four-plane mission to bomb Zeppelin sheds in Belgium, spotted an airship returning to Ostend from a bombing raid over England. Warneford harassed the Zeppelin until finally he was in a position to drop the six bombs carried by his tiny plane (a single-seater Morane Parasol) over the top of the retreating airship, which was only a hundred or so feet beneath him. The Zeppelin burst into flames, engulfing its small attacker and flipping it into a nosedive. Warneford regained control but had to land his plane to fix its fuel pipe. He managed to get airborne again but was soon lost and out of fuel. He landed once more and had to be refueled by the French before he was able to return to his own base. The British and their king, George V, were exhilarated by what Warneford had achieved. The pilot was awarded the VC immediately and shortly afterwards the French awarded him their Legion d’honneur. It was while in Paris to receive the award, ten days after his famous ‘stunt’, that Warneford was killed. He had taken an American journalist up for a flight over the French capital when part of the plane they were in snapped off, forcing the aircraft into a nosedive and flinging out its two passengers. Neither survived. An elated Britain was thrown into deep mourning. There is no doubting Warneford’s courage and character. These two links are well worth your time. The first: is the VC archives, where there is Warneford’s own account of his night over Ostend as well as details of his citation . The second: is the Royal Air Force Museum’s podcast about Warneford’s life. This podcast is eleven minutes of information rather than entertainment, but a little over ten minutes of our time today seems a small price to pay. If you can stick with the first few minutes you’ll be over the dullest part. This entry was posted in First World War, Zimbabwe and tagged Christabel Wise, Reginald Warneford's VC, Rhodesia, the First World War, Zeppelins. Bookmark the permalink.